Thousands of people, including prominent Russian and foreign politicians and activists, have bid their final farewell to Boris Nemtsov, an opposition leader, who was assassinated in Moscow last week. People stood in a kilometer-long queue to get to the memorial service, which took place in the Sakharov Center in Moscow (named after USSR dissident and human rights activist Andrey Sakharov). Not all were able to get inside. From there Nemtsov’s coffin was taken to the Troekurovskoye cemetery, where about 600 people attended the funeral, Interfax estimates. Among the government officials who attended the memorial service were Deputy Prime Ministers Sergey Prokhodko and Arkady Dvorkovich. A funeral wreath from Vladimir Putin was delivered to the ceremony. 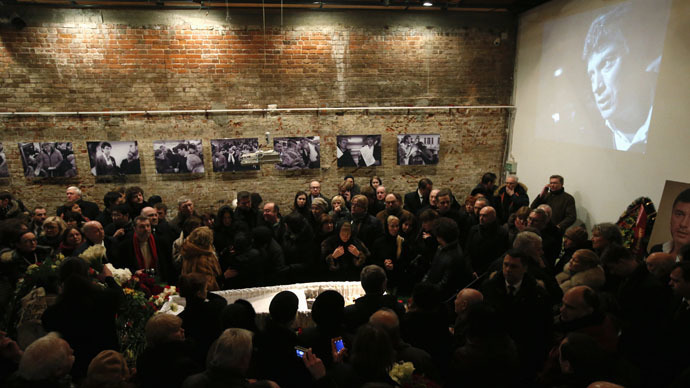 The bulk of those who came to pay their respect to Nemtsov represented the country’s opposition. Former British Prime Minister John Major, attended the farewell ceremony. US Ambassador John Tefft was also among the guests. “As governor of Nizhny Novogorod, deputy prime minister or as a leader of the political opposition, Boris Nemtsov stood for the best in Russia and ably represented the Russian people,” Tefft earlier said in a statement. Poland and Latvia complained that their senior officials, willing to attend the funeral, were not allowed entry to Russia. Russia’s Deputy Foreign Minister Aleksey Meshkov earlier explained that Polish Senate Speaker Bogdan Borusewicz was barred from entering Russia as he was on the Russian sanctions list. That did not prevent the EU from criticizing Moscow for what it sees as "arbitrary" refusal to allow certain European politicians entry into the country. "It is not the first time that we see such refusals for apparently arbitrary reasons," said European Commission spokeswoman Maja Kocijancic, as cited by AFP. Boris Nemtsov was shot several times just before midnight on Friday, while he walked across the Bolshoy Moskvoretsky Bridge leading from Red Square, in the company of a Ukrainian model, Anna Duritskaya. Sunday’s commemoration marches for the murdered politician drew tens of thousands of mourners across Russia. The politician’s murder could have been provocation to destabilize the political situation in Russia, according to the Russian Investigative Committee. They are also looking into four other possible reasons behind Nemtsov’s killing. It could also have been linked to the threats the politician received over his stance on the Charlie Hebdo shootings in Paris, or the current civil war in eastern Ukraine. The politician’s business activities and a possible assault related to his personal life are also being investigated. The crime has been condemned by leading politicians in and outside Russia, with US President Barack Obama, and German Chancellor Angela Merkel urging a thorough investigation of the crime. Nemtsov, 55, came into the spotlight as governor of the Nizhny Novgorod region from 1991-97. He then worked as deputy prime minister under President Boris Yeltsin. After 1998, he participated in the creation of several liberal movements and parties, serving as a member of parliament. In recent years, Nemtsov remained a vocal critic of Putin’s leadership, publishing since 2008 no less than four searing reports on what he called Putin’s failures and misdeeds as a public official. His latest electoral efforts were largely unsuccessful. He ran for mayor of Sochi in 2013, just as the city was preparing to host the Olympic Games, and scored 13.6 percent of the popular vote, losing the race. In the same year, he became the sole member of the regional parliament of the Yaroslavl Region from his latest political party, RPR-PARNAS.